“Let it be, let it be” went the old Beatles’ lyric, and this could very well be a mantra in gardening. Sometimes, sometimes a little, and sometimes not at all. Take, for instance, the climbing hydrangea cloaking the north wall of my brick house. Even now, bereft of leaves and flowers, the finger-thick vines, with their papery peeling, tan bark are a pretty sight weaving their way across and up the russet red wall. Come spring and through summer, bricks peek out from behind a cloak of heart-shaped, glossy green leaves. In summer, white flowers open on short, horizontal stems that reach out from the wall, the whole effect, with the leafy background, like twinkling stars against a dark sky. I planted the vine about 7 years ago, knowing that it’s slow to get started and that it can coexist with trees or brick walls, damaging neither. 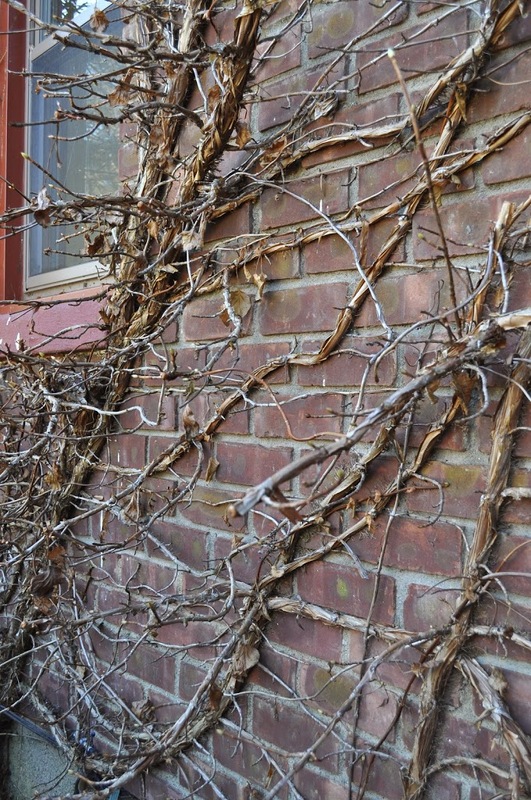 My plan with this vine has been to “let it be” although I did wonder what might happen once stems reached roof eaves and corners of the wall. Now I know: A couple of years ago, stems began to reach around the two corners to start their journey to the other house walls and initially thin stems also began to work their way beneath roof fascia. The house would look cool thoroughly enveloped in this beautiful, ever-expanding vine, but could the structure handle it? I drew the line, with pruning shears, loppers, extension shears, and ladder, at roof eaves, wall corners, and windows (also threatened), lopping or breaking off errant stems. Climbing hydrangea is just too pretty to remove completely. I can “let it be,” but not too freely. For the past few weeks, Whenever I sit down to eat I also give an occasional, worried glance at the bare bulb sitting on a plate at the far end of the table. A pointy shoot a couple of inches long pokes out its top. Has it grown longer? I’m wary because I had this plant once before, decades ago. I knew I could “let it be.” The bulb doesn’t need to be planted! Even without soil, the shoot will stretch upward and then an eerie purple “flower” will unfurl, much like an upside down skirt. 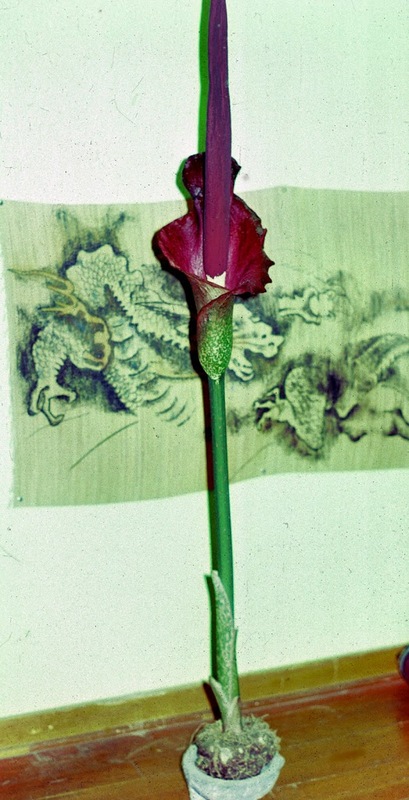 Up the center of the flower will rise a long, pointed, purple stalk (which is actually a spadix on which are the true flowers). So far, so good. The problem is that Amorphophallus, the botanical genus of this plant, is pollinated by carrion insects, and the fully open flower attracts its pollinators by reeking of dead flesh. To spare my very sensitive nose, I have to stand ready to cover the plant’s head in a plastic bag and whisk it down to the basement at the first hint of carrion-ness, just like I did with the plant I had decades ago. Or just lop the head off. I accepted a recent offer of this plant, which multiplies readily, because it’s so interesting and so attractive, sort of. 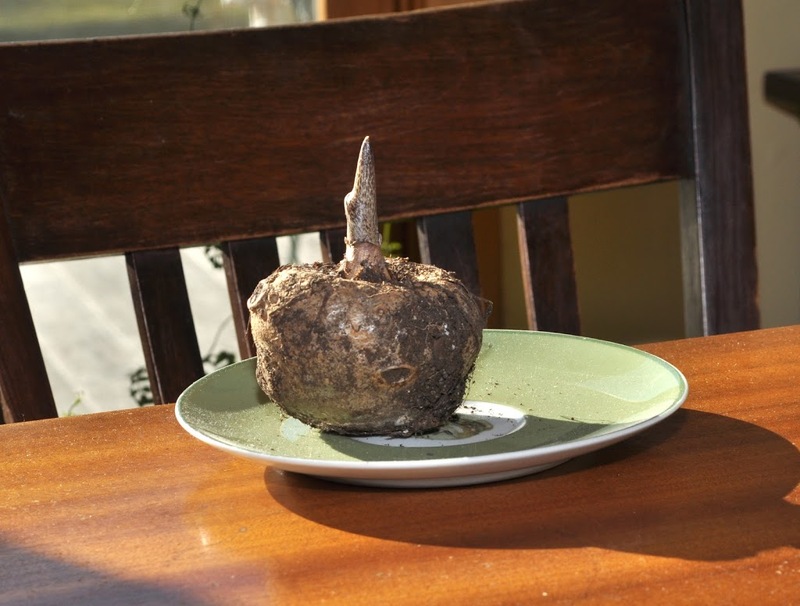 Once the bulb calms down from flowering, it does need soil, either in the ground in spring or in a pot. Then comes a leaf stalk, pale, olive-green with dark-brown splotches. When the snake-like stalk reaches a couple of feet in height, a single leaf unfurls into three leaflets that spread out like spokes of a wheel. At this stage, the plant is quite attractive and still eerie. Last night at dinner, as I was eyeing Amorphophallus, I was enjoying a fresh, very, very local salad; the ingredients travelled 75 feet, from my greenhouse. A welcome crunch to these fall and winter salads is fresh celery. 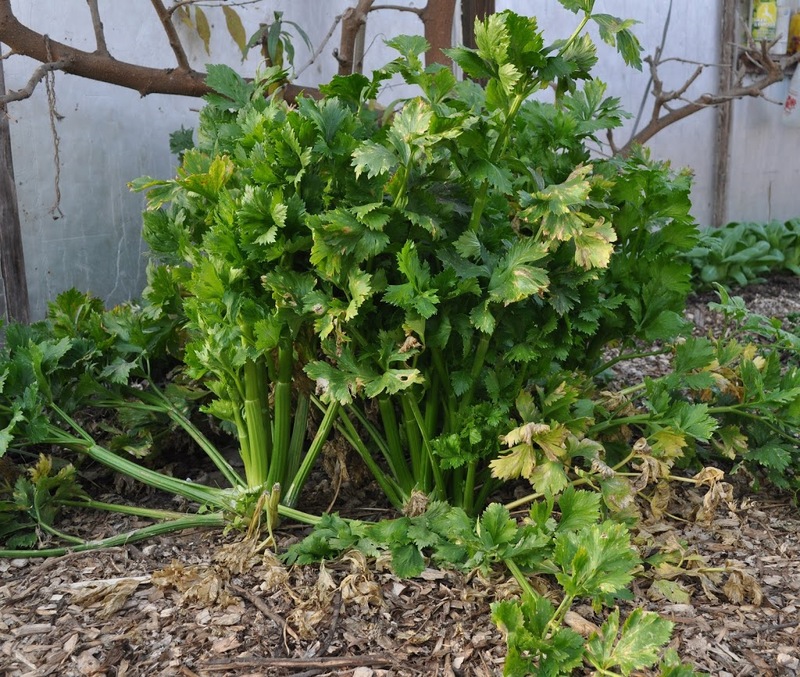 Celery is not the easiest vegetable to grow. The tiny seeds germinate slowly and take a long time to mature into succulent, crunchy stalks. And then, for best eating the plant topnotch growing conditions: cool, moist soil rich in nutrients and organic matter. This entry was posted in Uncategorized and tagged amorphophallus, Beetles, celery, hydrangea, vine. Bookmark the permalink. Trackbacks are closed, but you can post a comment.